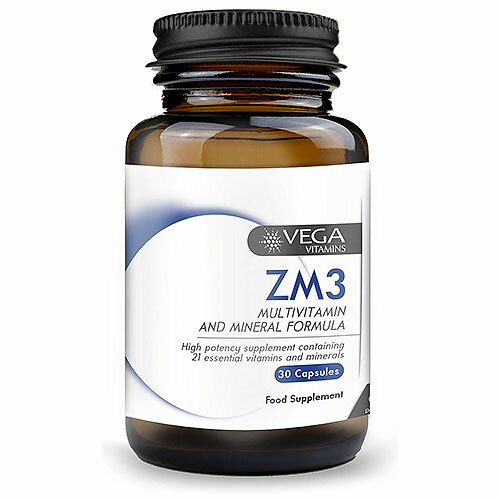 VEGA ZM3 Multivitamin & Mineral formula is a high potency supplement containing all essential vitamins and minerals at higher, individually optimised levels, plus a wide range of antioxidants to help protect against cell damage. The formulation delivers up to 300% of the recommended daily allowance of key nutrients, which are in highly bio-available forms that the body absorbs well. It is a fantastic base to any supplement regime. As a food supplement. Take 1 vegicap daily with meals. Long term intake of 24mg of Vitamin B6 may lead to mild tingling and numbness. Below are reviews of Vega Vitamins ZM3 Vitamins & Minerals - 30 Capsules by bodykind customers. If you have tried this product we'd love to hear what you think so please leave a review.